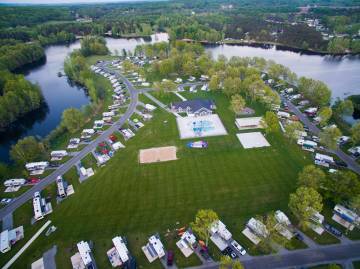 Description: Dunes Harbor Family Camp is a premier Christian family campground next to Silver Lake and the Sand Dunes. Located just one mile from the Sand Dune ORV entrance, Dunes Harbor is a perfect family getaway in West Michigan. Dunes Harbor has over 150 campsites with Full Hook-Up 30/50AMP sites as well as rustic Water/Electric sites. Each site has a picnic table and firepit. Every Full Hook-Up site has a cement pad. There is family programming for all ages including hiking trails, horseback riding, craft times, movie nights, and much more. Dunes Harbor has a modern waterpark style pool and waterslide. Other amenities include camp store, ice cream shop on-site, laundry, clean bathhouses, playgrounds, and pavilions for group gatherings. Dunes Harbor specializes in group camping opportunities. Contact us on how your entire family, friend group, church, business, or club can camp together.